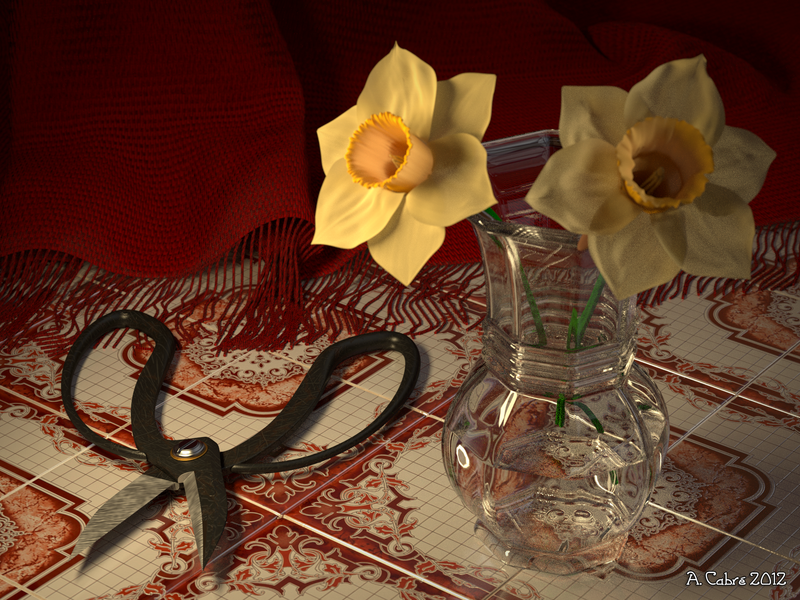 Here is my (most likely) final render of the Daffodil scene. I decided to add an HDR to get more interesting reflections on the glass. I set its intensity to a fairly low amount, so that the overall feel would not be lost. I rendered it to just 1000 samples in Cycles, because I wanted to keep some of the graininess, which sometimes can add interest to an image. I applied a bit of color correction in Photoshop. At some point in the future, I would like to make a digital painting version of it, since the initial inspiration has always been 17th century paintings with high contrast between shadows and lights. Another render from a different angle, with a slightly different setup. Very nice Andreu! Reminds me of some of the Dutch Still Life painting. Is the cloth a texture material with bump? Yep, that's what it is :) I'm glad you like it!